Multidirectional forging (MDF) was applied to Mg-6%Zn alloy up to 5 passes successfully at 280 °C. MDF-processed materials were characterized using optical microscope, scanning electron microscope, electron backscatter diffraction, transmission electron microscope, and x-ray diffraction. Obtained results showed a significant reduction in grain size (up to 3.8 μm) having a large fraction of high-angle grain boundaries after 5 passes of MDF process. 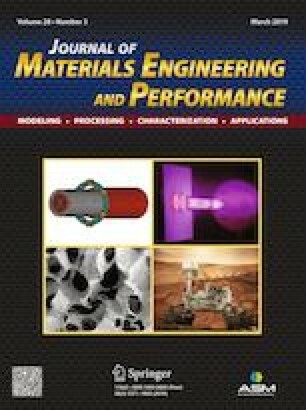 Maximum tensile strength of 230 MPa was achieved for 5-pass MDF-processed Mg-6%Zn alloy which is about ~ 2.0 times higher in comparison with that of homogenized alloy (117 MPa) and was attributed to higher dislocations density and grain refinement. Corrosion behavior of the alloy was investigated in 0.1 M NaCl solution using potentiodynamic polarization test, electrochemical impedance spectra analysis, and immersion tests. It was found that the corrosion rate of 5-pass MDF sample improved (0.34 mm/year) ~2.5 times in comparison with that of homogenized Mg-6%Zn alloy (0.86 mm/year) due to fine grain structure, which creates more grain boundaries that act as a corrosion barrier. The authors gratefully acknowledge Exclusive Magnesium Private Limited, Hyderabad, India, for their help with the processing of Mg-Zn alloy and gratefully appreciate Dr. Shashank Shekhar, Materials Science and Engineering, Indian Institute of Technology, Kanpur, for his support and interaction in extending electron backscattered diffraction (EBSD) facility.